In November, we celebrate National Home Care Month and National Family Caregivers Month, two observances that are core to FirstLight Home Care. Throughout the month, our FirstLight blog will focus on providing the tools, tips, resources and peace of mind so many family caregivers need. We invite you to comment and share the challenges and rewarding experiences you’ve encountered throughout your caregiving journey. Because caregiving is emotionally and physically draining, it can lead to caregiver burnout and possible health issues for you – the family caregiver. Because family caregiving is emotionally and physically draining, it can lead to caregiver burnout. For many, taking on the role of family caregiver is unfamiliar territory. While caring for a loved one is a worthwhile responsibility, it also can cause a significant amount of stress, exhaustion and sometimes even health issues. Because caregiving is emotionally and physically draining, it can lead to burnout and possible health issues for you – the family caregiver. There are ways to help prevent family caregiver burnout, and it begins with recognizing the warning signs. Read about some of the signs to be mindful of, as well as what you can do prevent caregiver burnout. Are you a family caregiver who is seeing one or more of these signs in yourself? Take action immediately to prevent caregiver burnout and preserve your health. Confide in someone close to you. Talk to a friend you trust, share your feelings of frustration and anger and allow them to listen to you. Remember that it’s normal to have negative feelings about this rewarding responsibility. You could also find a support group in your area to discuss your experiences and connect with others who are in a similar situation and can relate to what you’re going through. Consider asking for assistance. Accept that you might need caregiving assistance. Don’t be afraid to ask for help from those who can share in the caregiving responsibility. 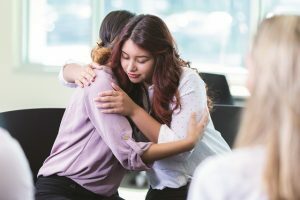 Even if friends or family members cannot step in to help relieve some of the burden and responsibilities, they might be able to provide a different perspective on the situation, offer guidance or advice. Set aside time for you. Taking care of yourself is a necessity. Prioritize activities you enjoy, even if it’s just for a short period of time. Taking a break to sit and relax or read a book, or getting out of the house to take a short walk can be enough to recharge and regain some energy. It’s also important to focus on your personal relationships by staying in touch with family and friends and spending time with them when you can. Consider respite care services. Respite care services can offer temporary relief by having a professional caregiver come in and take care of your loved one. It allows you to take time off from your responsibilities as a primary caregiver so that you can focus on yourself. Caregivers are there to make sure your loved one is cared for in a safe, familiar environment while you take a much-needed break. Maintain your own health. Eating well, exercising and getting plenty of sleep can keep you healthy so that you can better care for your loved one. Also consider daily meditation, which can help relieve stress and keep you relaxed. And don’t forget about your own doctor visits. When you get busy taking care of someone else, you often miss your own check-ups and appointments, which can lead to health issues down the road. Accept the choice you’ve made. Acknowledge that you made a conscious choice to be a family caregiver, and remember all the positive reasons behind that choice. Recalling these reasons can help get you through some of the most difficult times. And there is no shame in finding ways to applaud yourself and what you’re doing, especially if you’re not getting appreciation from others. What are some of the warning signs you’ve noticed when it comes to burnout? How have you dealt with frustration, depression and stress to prevent caregiver burnout? Comment here or head over to the FirstLight Home Care Facebook page to join the conversation. For additional tools and tips, visit this helpful caregiver toolbox from the Caregiver Action Network.